With the countdown to the UK election well underway it seems that every party wants us to believe their values are our values, but is that true? 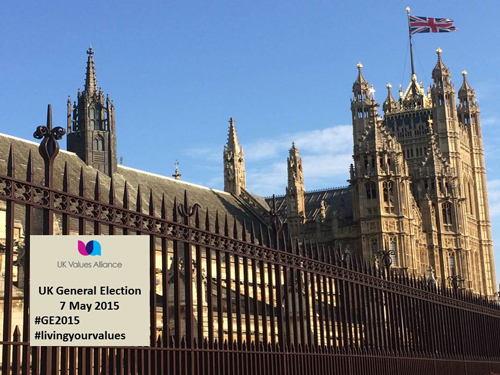 To find out about values in politics in more detail the UK Values Alliance launched a campaign five days ago entitled ‘UK GENERAL ELECTION 2015 – A FOCUS ON VALUES’. The purpose? To gain insight into how much importance is really attached to the topic of values by parliamentary candidates standing for election in 2015. What are your five highest priority/core values as an individual standing to become an MP? What are the five highest priority/core values for your political party? What are the five highest priority/core values you would like to see present in UK society? Whilst the UK Values Alliance sees this is as a non-partisan enquiry, they will share what they learn in response to their 3 questions, both as general findings and broken down by political party. In the interests of transparency they will also share response rates by party. Everyone is welcome to join in. If you wish to write and ask the candidates for your constituency these same values questions UK Values Alliance invites you to use the example letter on their website at https://valuesalliance.co.uk/uk-general-election-2015-a-focus-on-values/. If you get a response the UK Values Alliance would love you to share the answers via their contact form on their website https://valuesalliance.co.uk/contact/. The deadline for responses is 20th April 2015. Social media is an important part of this campaign. Everyone is encouraged to tweet about it using the hashtags #livingyourvalues and #GE2015. Be warned, what you discover about the values of your candidates may well influence the way you decide to vote. If you want to find out more and contribute your voice towards supporting the ‘Focus on Values’ campaign visit the UK Values Alliance website now. The UK Values Alliance is a collaborative group seeking to promote values in society. Its members are individuals and organisations who are either interested or active in the field of values, whether they are Personal, Organisational or Societal. This group seeks to bring values back to the heart of UK society. This entry was published on April 16, 2015 / IndigoTree Digital. Posted in News. Bookmark the permalink.